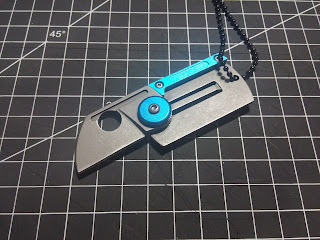 I've received the Panchenko style Dog Tag clone knife from Fasttech and would like to present to you a short review of it. The knife comes in a tin round presentation box and comes with a black chain to wear on the neck (as a dog tag style jewelry). It is sharp out of the box and has no immediate drawbacks. The scale is made from stonewashed steel (matches the finish on the blade), the backspacer and the pivot screw cover are made from anodized blue aluminum. The blade is held by the detent in both directions, lockup is OK. It came a bit dry in the pivot area and made a noise when opening/closing but since I put a little bit of lube on the detent ball, the problem was gone. - Small, slim size and light weight (1.11 oz) make it a great EDC'able carry, whether on the neck or on the keychain. - I liked the overall execution, starting from the acid stonewashed finish on the scale and the blade, to the anodization on the aluminum parts and the smooth cutouts and edges. - The knife is non locking, meaning it will be considered legal to carry in countries, where locking blades are prohibited. 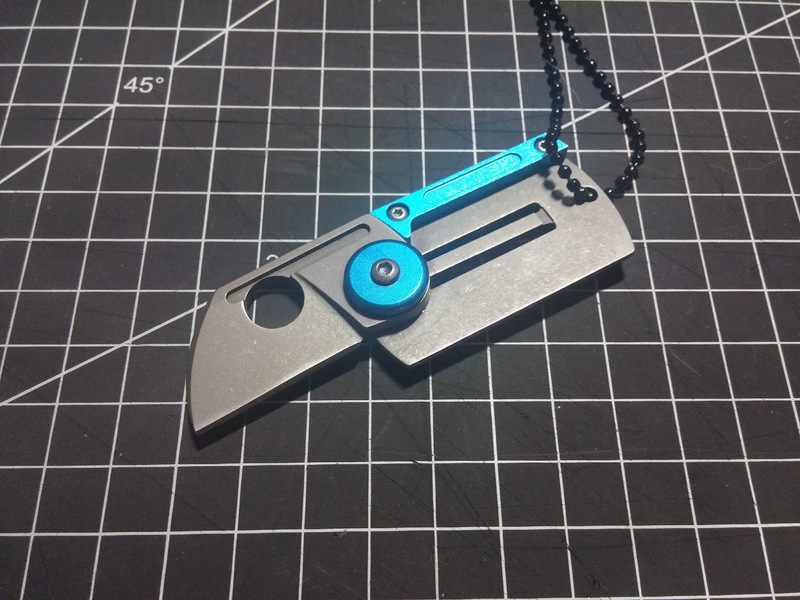 - The overall looks (I prefer the looks of the clone over the original, because of the color of the scale) and original concept (gotta give credit to Serge Panchenko, the designer of the original Spyderco Dog Tag Knife). - The knife is easily opened one-handed (can't be flicked out though). - The ergonomics. It isn't made to do hard work, but I think it wasn't designed for this as well, more suitable for light EDC tasks. - Blade-to-Handle ratio (Bean clone is better in this sense, but this one is more practical than the coin knife). This is a very cool little knife, that combines the concepts of man-jewelry and small EDC knives. It isn't designed to be a primary carry, but more of a people friendly knife, a real conversation starter, which could also function for light EDC tasks (such as box cutter and letter/package opener) and serve as a great, original gift.